Let’s review: one individual, Representative Ilhan Omar (D-Minn.), consistently minimizes terrorism while condemning efforts to combat it. Prior to coming to Congress, she wrote to a judge to request leniency for a man convicted on terrorism-related charges. She laughed in an interview when discussing how a professor’s reaction to mentions of al-Qaeda or Hezbollah differed from when America or England were mentioned. And during a speech on behalf of a group created at the behest of the Muslim Brotherhood, she expressed an offhand dismissal of the worst act of terrorism in U.S. history. Without question, one of these two individuals made comments “designed to incite hatred” that are putting “life at risk.” But according to leading Democrats, that person would be the president and not Omar. One could hardly look for a better example of the inversion of morality, and of hater and hated. The more one studies her remarks, objectively and in full context, the more obvious it becomes that Ilhan Omar is a bigot of the most vile sort. Her “some people did something” speech was a whitewash of the Council on American-Islamic Relations (CAIR), which she claimed was founded after 9/11 to protect Muslim-Americans from Islamophobia. In reality, CAIR was founded in 1994, long before 9/11. Its goal was not to defend the rights of Muslims, but to promote the ideology of the Muslim Brotherhood and thus offer indirect support for global terrorism. Because the United States looks narrowly at the proven activities of each individual organization, the federal government does not classify CAIR as a terrorist organization. But the United Arab Emirates looks at the broader ecosystem behind the Muslim Brotherhood, and on that basis, it does so characterize CAIR. That is the group Omar portrayed as a civil rights organization. Her characterization of Jews as a secret cabal hiding its evil from a gullible world, using ill-gotten gains to buy influence and control, is by no means original. It is without question the single most dangerous, murderous lie in world history. Yet, after her latest go-round with this same sad canard, Democrats found themselves unable to condemn it—instead producing a hopelessly weak resolution that listed Pacific Islanders before Jews on its list of those targeted by hate. This has rapidly become a pattern. On her popular Fox News program, Judge Jeanine Pirro wondered aloud whether Omar derives her anti-American values from her adherence to Sharia law. This, we were told, was hate speech rather than a reasonable question. Just weeks later, New York City’s leftist mayor, Bill De Blasio, called for an Orthodox Jewish city councilman to be removed from New York’s immigration committee for having the temerity to point out that “Palestine does not exist.” Acknowledging reality was deemed offensive to Palestinian Arabs, and Council Chairman Corey Johnson agreed. Of course, liberals were experts at distorting words and meanings long before they decided to portray a condemnation of terrorism as hate speech. And since 2016, their favorite target has been President Trump. So it should surprise no one that they are staying true to form. The president never mocked a reporter’s disability, for instance—in fact, due to his actual medical condition, that reporter could not replicate the weak, waving gesture used by the president if he tried. Yet the lie persists. The president never called neo-Nazis “fine people,” either, as anyone capable of reading English can readily confirm. And no, in no way did the president’s condemnation of Omar’s hate speech amount to hate speech itself—much less incite anyone to violence. Now Democrats are sponsoring a bill to reverse the president’s decision to restrict immigration from countries on a terror watch list, due to the president having called this a “Muslim ban” during his campaign. Unsurprisingly, Omar is a co-sponsor. The countries in question represent less than 10 percent of Muslims worldwide, and all of them were identified as harboring terrorism on a list created during the Obama Administration. It is sound and rational policy, rather than an expression of “Islamophobia,” to limit immigration from those countries until America can distinguish true refugees from those radicalized to hate our values and to murder us in the name of Jihad. Omar and her fellow Democrats are playing games with the president’s poor wording, in order to make all of us less safe. When people are twisting words to support bigotry and minimize hateful violence, calling them out for it isn’t “hatred,” but something we should hope to see from any responsible leader. This content is courtesy of, and owned and copyrighted by, https://amgreatness.com and its author. This content is made available by use of the public RSS feed offered by the host site and is used for educational purposes only. If you are the author or represent the host site and would like this content removed now and in the future, please contact the USSANews.com administrator by using the contact form located in the top-left menu. Your request will be immediately honored. Please visit https://amgreatness.com for more terrific, conservative content. 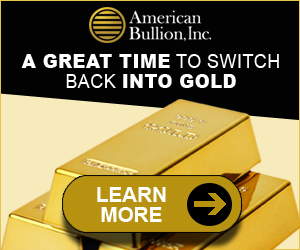 The owner of this website may be paid to recommend American Bullion. The content of this website, including the positive review of American Bullion, the negative review of its competitors, and any other information may not be independent or neutral.